My creativity and artistic interest has been a thread running through the fabric of my life. Raised in a loving environment where creativity was nurtured and encouraged, I experimented with just about every kind of creative expression from finger paints to technical drawing. Believing a career in art would not sustain me, I chose to train as a Technical Illustrator, a safer more believable career path. I stumbled across graphic design during my training, fell in love with the medium and now have over 20 years of experience as a designer and illustrator. My career also includes creative leadership, art direction, brand identity, product design and marketing; all of which combine to provide the knowledge and skills to collaborate on a wide variety of projects. 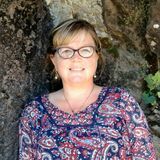 My artwork is a heartfelt reflection of the beauty and wonder of nature, whimsical memories from my childhood, and from watching my own children as they encountered the world and discovered the wonder in everyday simple things. I make my home in the beautiful Pacific Northwest surrounded by trees and wildlife. I live with my husband and a stable of pets, two Welsh Corgiâ&#x20AC;&#x2122;s (a rather spirited one and one that is basically a door stop), an old toothless kitty, a black-pather-esque kitty and a posse of chickens. We also raised three wonderful adult children; a daughter and two sons. Following are pages filled with examples of some of my hand-spun and digital illustrations as well as surface pattern designs. Iâ&#x20AC;&#x2122;m available for licensing or commissions. To contact me, give me a call at 541.602.5670 or drop me an email at hello@illustrationsbyjeri.com. My daughter lives in the beautiful land of Australia and this collection was inspired by a visit where we camped in a caravan across the outback, exploring majestic coastlines, incredible vistas and unique animals. Inspired by a love of vintage wind-up and pull toys, this collection brings up memories of my grandmother. She always had a way of making the past come alive with her stories. I loved to imagine her as a little girl playing with these toys. I live in the Pacific Northwest where animals are a big part of our culture. I have loved animals since I can remember and they have been the source of inspiration for my artwork for much of my life. This collection was inspired by the love I have for nature and the beautiful place I call home. On my first visit to Australia, one of my first memories was stopping to see a black swan at a park on the side of the road. She climbed out of the water and headed over toward me in a sauntering sort of way. She was so incredible (and a bit intimidating) with her little red eyes and I understood why they are associated with royalty. My mother is one of the most positive and inspirational people I know. One of her favorite songs is â&#x20AC;&#x153;The Wind Beneath My Wingsâ&#x20AC;? by Bette Midler and she always gives me gifts with inspiring and happy thoughts, often with dragonflies or butterflies. This collection was designed to be uplifting, bright and happy, just like my mom. Oregonâ&#x20AC;&#x2122;s majestic coast has so much inspiration to offer. The ocean, the wild shoreline, the diverse animals and the opportunity to share in natureâ&#x20AC;&#x2122;s splendor in so many different ways. This collection was inspired by a recent trip I took down the southern Oregon coast with my husband. Who doesnâ&#x20AC;&#x2122;t love dressing up in costume and pretending to be someone else? Halloween is such a fun celebration of creativity and joy! This collection was inspired by pillowcases filled with candy, uncomfortable masks and being easily spooked for one night a year. Available for licensing! 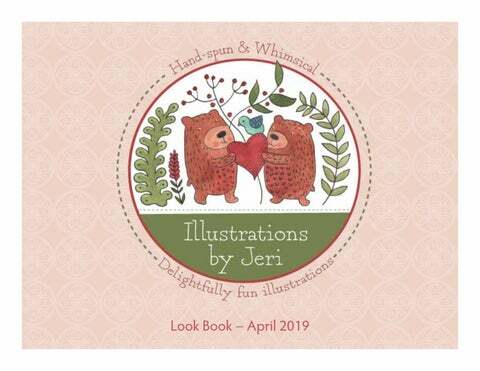 hello@illustrationsbyjeri.com 541.602.5670 illustrationsbyjeri.com All artwork copyright protected by Jeri Hauth 2016-2019 | All rights reserved.